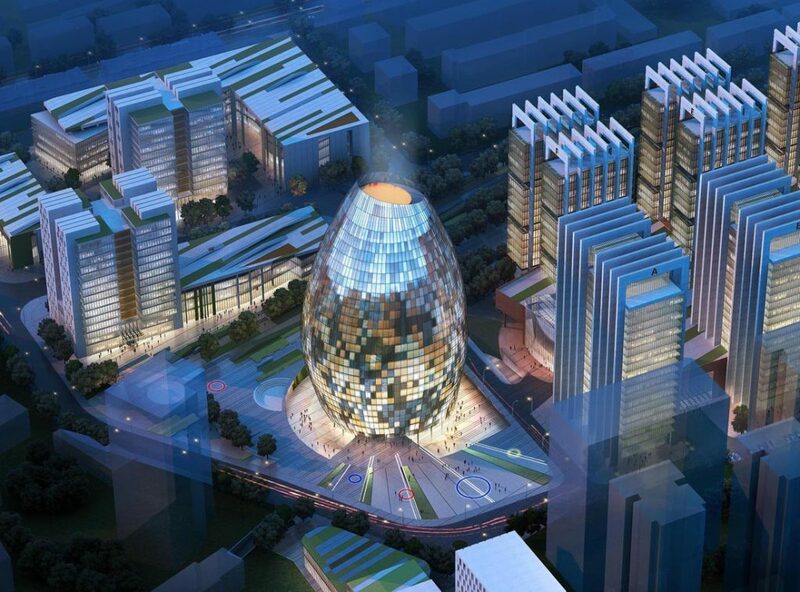 The project is located northwest of the 3rd Ring Road within Beijing’s Zhongguancun High-Tech Zone. The plot owned by the Aviation Industry Corporation of China (AVIC) will be transformed into a mod­ern research & innovation center for the booming aviation industry. 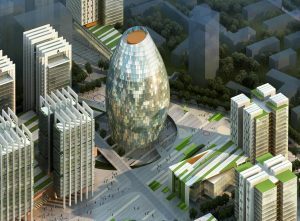 Its architecture, landscape and traffic are focusing upon the main and tallest office tower housing AVIC’s headquarters. Aviation Industry Corp. of China & China Aviation Planning + Construction Developm. Co., Ltd.
Continue reading "AVIC Headquarter Tower"
A mix of human scale and green technology forms the corporate image and the chance to give the company a thriving, prosperous impetus. The headquarter tow¬er emerges vertically as image and landmark of the whole plot. It resembles a jet turbine: generated by a radial plan, narrower at the base, widening on the floors above before tapering to its top, giving a distinctive outline on the masterplan. 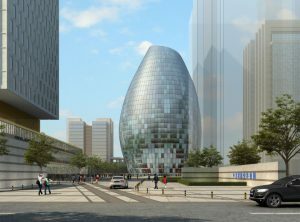 The building is curved vertically and horizontally. Without sharp edges it is hard to catch the real scale of the building, giving it a sense of lightness compared with the surrounding high-rises. The tower appears more slender than a rectangular block of equivalent size. Moreover, the aerodynamic form – like wings of an airplane – is minimizing wind loads on the structure and cladding. 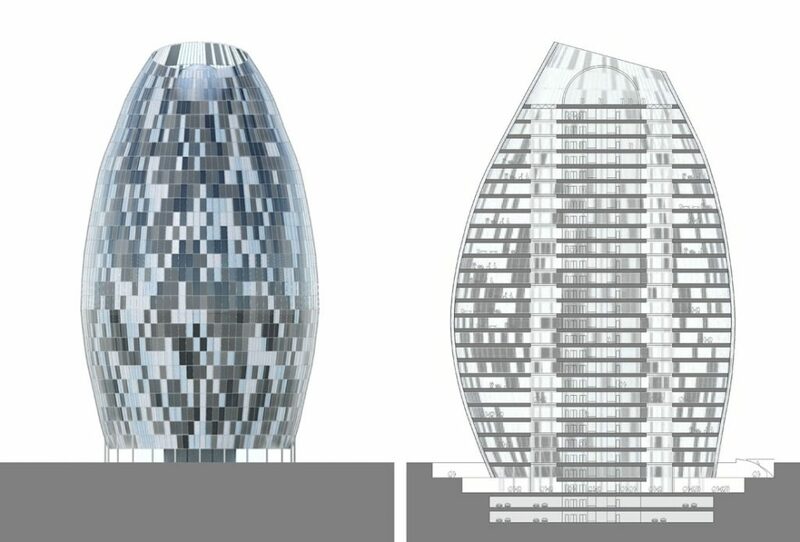 The shape allows much of the area to be landscaped, providing a valuable outdoor area in the heart of the masterplan. The base of the building is a circle, surrounded by a sunken plaza. 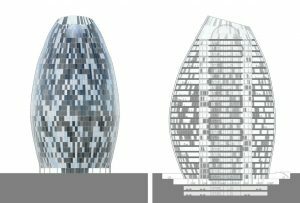 The distinctive tower has been designed as a ‘green building’ that resolves walls and roof in a continuous skin. A fully glazed double-façade – highly insulated and with integrated sun-protection – is opening up the building to light and views. 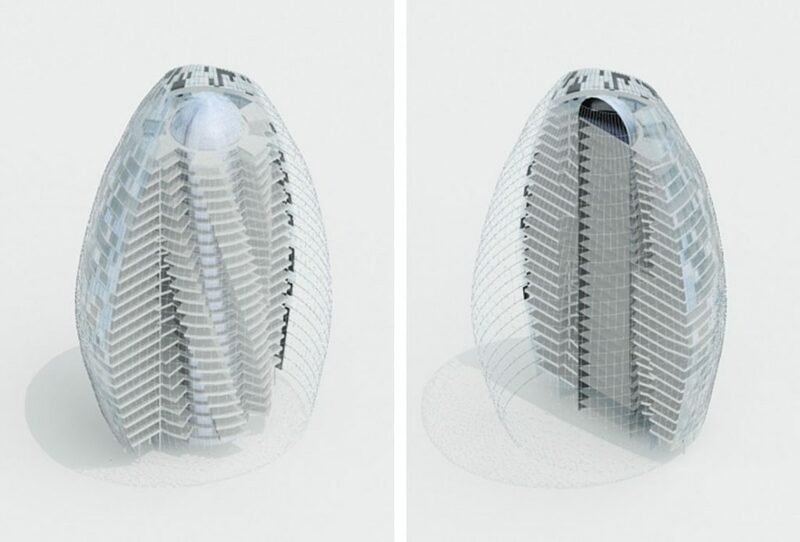 Atriums between the radiating fingers of each floor are linked vertically in a spiral. In this way a series of informal spaces – as refreshment points or meeting areas equipped with cascading greenery as winter gardens – are created inside the building. 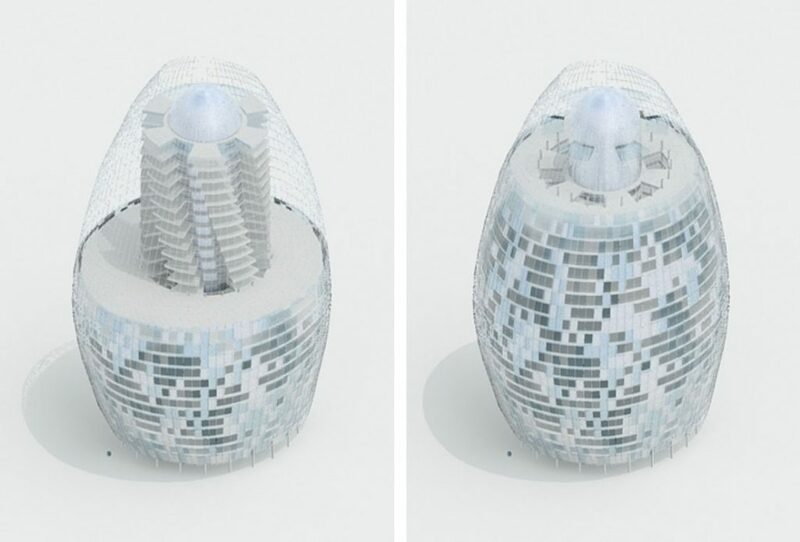 The tower is naturally ventilated, as fresh and filtered air is drawn up through the double-façade and the spiraling light wells (functioning as the building’s “lungs”), reducing the need for air-conditioning and central heating. Light wells and building shape maximize the amount of natural light throughout. 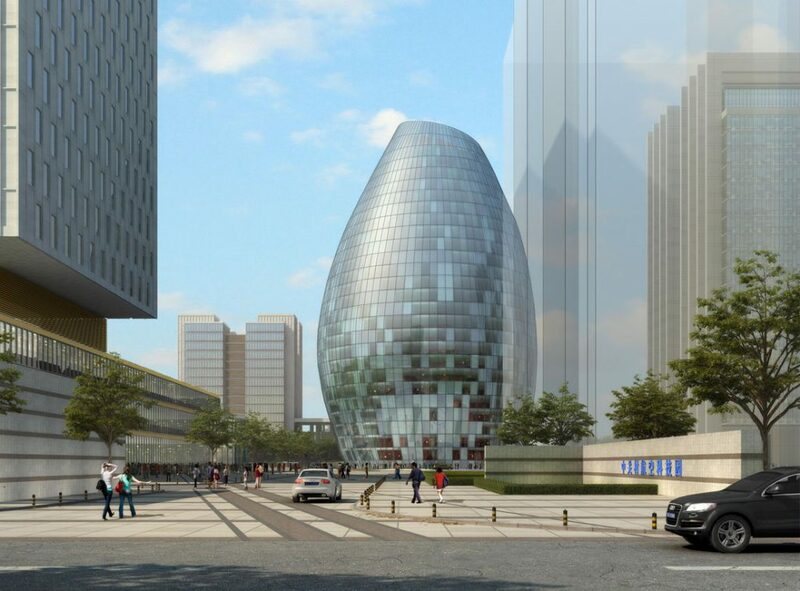 The exterior cladding is made of glass panels of various transparencies. The office areas are equipped with a double skin with central ventilated cavity containing solar-control blinds. 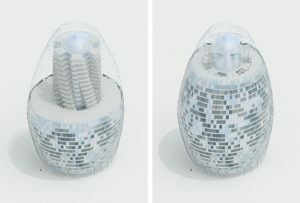 Last not least, the tower generates a strong night-time image thanks to its ‘vibrating’ façade.